Areas both inside and outside gates wear down from heavy usage. These areas do not support growth and are prone to erosion. Photo courtesy Deb Balliet. Gates and pasture edges wear down from heavy usage, creating a dirty, hard to navigate area that goes from mud pit to hard pack with the weather. Nothing grows in these worn areas and soil washes away in rain, destabilizing nearby fence posts and contaminating nearby water. Horses congregate at gates. A muddy gateway can also be dangerous as handlers move horses in and out. Watering areas will wear down the same way. Create a well-drained entryway and watering area surface. 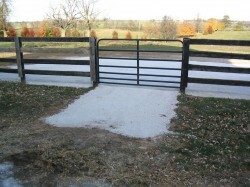 Utilize layers of course and fine gravel to create a pad inside and outside of the gate. Use geotextiles or other soil stabilizers as needed. To encourage regrowth along the fence lines, loosen compacted soil and reseed the area. This will encourage regrowth. Mulch newly planted areas but do not spread fresh manure over the area. Fresh manure attracts more horse traffic and smothers young plants. 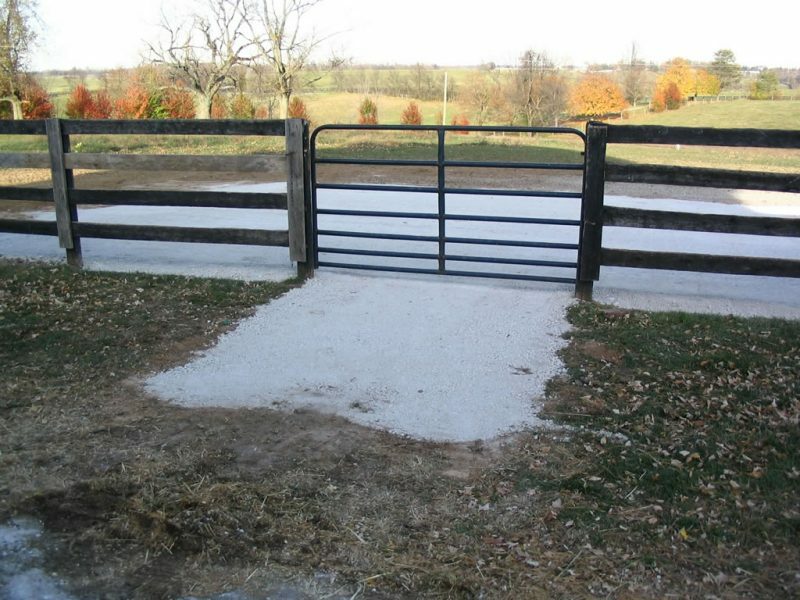 Utilize layers of course and fine gravel to create a pad inside and outside of the gate to protect your pasture edges and gate areas. Photo courtesy of University of Kentucky Department of Agriculture. Do not feed along the fence line or near the gateway. Take feed out to the center of the field. Locate gateways in the center of fence lines, not on corners. This is safer for horses and handlers, and discourages tight grouping of horses. Do not use chemical weed killers beneath fence lines. Use a weed eater or weed-specific herbicide to keep weeds under control. For more information on protecting the pasture edge in your area, please visit your Extension Office here or here.